Big GameFair Chase Hunting Behind High Fences? Fair Chase Hunting Behind High Fences? Is it possible to have a fair-chase bowhunt inside a fence? Bowhunting just isn't as simple as it used to be. Gone are the days of picking any old weekend to hunt. Instead, now we need days and weeks—sometimes months and years—to put a plan to work. We've devolved into an age of limited entry permits and preference points, of lottery hunts and demand-exceeds-supply non-resident hunts. Even a computer wired to the Web won't shortcut the process of researching a quality hunting experience. The conventional alternative, of course, is a reputable guide or outfitter. These folks can put you on game, provided you do your homework and come up with the right handshake. But an increasingly popular option for a high-octane hunt is the hunting preserve. While some authorities label it a mockery of sport hunting, others consider it a fair hunt at a fair price. So which is it: devil or angel? Read on. Whatever you choose to call it—trophy ranching, high-fence hunting, preserve hunting—the basic premise is providing a quality hunting experience in a controlled environment. The big question is whether or not the hunt is fair chase. While the natural tendency is to point a finger at the operation—fences eliminate free-ranging game, and some outfits advertise "100% success"—I think the starting point is your personal "hunting ethic." To begin with, what is your goal? An "easier" hunt? A guaranteed trophy? While these types of hunts no doubt exist, they're not what this article is about. "I abhor canned hunts," acknowledges Ron Walker, founder of Top Rail Outfitters. "Professional [game ranchers] denounce 'guaranteed' hunts and make every effort to provide fair-chase hunts in a pleasant setting. The real source of ethics isn't necessarily with the hunt itself, but rather with the hunter. How you hunt defines you as a person and colors the chase, which is really the main event.” Briefly, unethical activities include mechanized travel to locate or "intercept" game; hunting in restricted quarters (less than, say, 1,000 acres); and hunting "released" game that previously lived a domestic lifestyle. 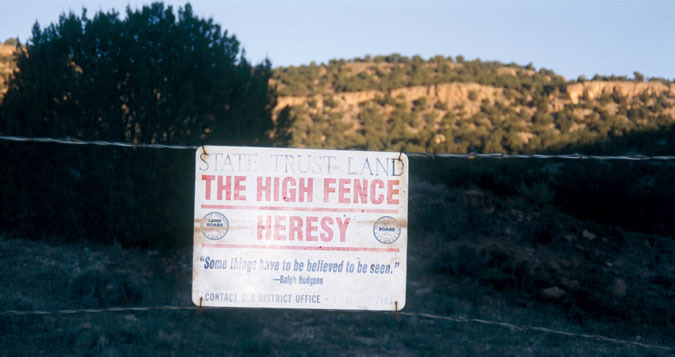 To my way of thinking, there are two main reasons to go "high fence." One is to experience a hunt that would otherwise be unaffordable. The other is experiencing a hunt that would otherwise be unattainable. Examples of the former include exotic species that normally require large expense accounts and overseas travel, and examples of the latter include areas intensively managed for mature animals. (See Buckmasters Editor Russell Thornberry's comments in sidebar.) There's a third reason: accommodating the physically challenged. Society universally recognizes a responsibility to these hunters—crossbow exemptions are common—and affording them options on private lands is consistent thinking among public officials. What is a preserve hunt really like? The irrepressible Ted Nugent, never one to avoid a debate, summed up his feelings from a recent preserve outing: "As we dined on succulent, seared tenderloin and roasted potatoes and peppers, we raised a toast to the beast of the mountains and prairies … and to the satisfying fact that there are more elk in the world today than there has been in more than 100 years. It is good to be an elk hunter." Preserve elk are not the monopoly of celebrities. Affordable hunts wrapped in classic mountain scenery are available to those who save up and plan ahead. Pennsylvania bowhunter Jason Hummel twice visited Top Rail Ranch, a 2,800-acre preserve at 10,000 feet in central Colorado. "Find a place like this [where the elevation and terrain] match the kind of setting you'd expect on a Western 'mountain hunt,' and you've found a touch of heaven," says Hummel. "But don't take [these hunts] too lightly. We spent as much time researching and preparing ourselves mentally and physically for this hunt as any public-land [outing]." 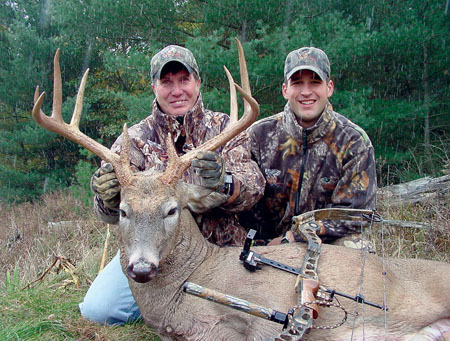 Skipper Bettis helped orchestrate Michigan's first whitetail hunting ranch, the famed Sanctuary, and a decade later he launched Legends Ranch. Is it bowhunter-friendly? "[My bowhunt] was the best I've ever had and probably ever will have," recalled Texas-based outdoor writer Jeff Copeland. "I now know why some hunters [leave the Ranch] empty-handed, and why some return home with a trophy of a lifetime." Gerald Bethge, former editor of Outdoor Life and Harris Publications, also hunted with Bettis a few years ago. After some good-natured ribbing he cracked, "You owe it to yourself to experience a hunt like this at least once in your lifetime. It was the way a dream hunt should be." Perhaps that's why some of the biggest names in the hunting industry trace Bethge's footprints, even though you may not hear about it. Recently I asked a prolific freelance outdoor writer and editor to share his thoughts on one of his "high fence" hunts. He replied, "I really have no comment." On the other hand, Bob Foulkrod, in describing a Pennsylvania trophy ranch bowhunt for top-end whitetails, played it straight: "I don’t care what anybody thinks or says. It was a great hunt. It was exciting. It was challenging. It's in my memory, and nobody can take it away." My personal experiences on this subject are limited, but a few years ago I was invited to participate on a "cull hunt" in which I was limited to bucks with specific deficiencies; those younger than 4 1/2 years old or sporting good genetics were strictly off-limits. The square-mile "research enclosure" was built and maintained by a popular game call manufacturer, and they did their best to grow quality whitetails. What did I learn? That "fenced-in" whitetails aren't necessarily "hemmed in" whitetails! A week of all-day treestanding produced a lot of sightings of a lot of deer but, alas, the only buck I could get within bow range was a 160-class 12-pointer that was judged—you guessed it—a 3 1/2-year-old. As I said, bowhunting within game-proof fences is a personal decision that's sure to be viewed differently for different reasons. As an example, I know a trophy whitetail expert who enters all of his bucks in the Pope & Young record books. 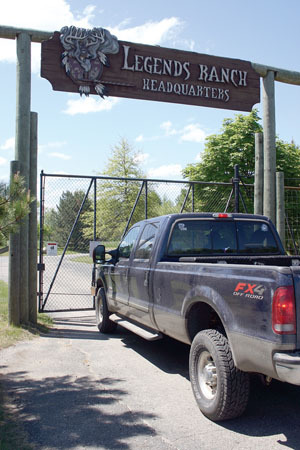 The Club's stance on high fences precluded him from even contemplating a recent lottery hunt conducted on the Meredosia National Wildlife Refuge (areas involving game-proof fences). Yet, by any other standard, this was an exceptional hunt managed by a respected national agency. I guess the bottom line is that your decision should be made with your heart and not just your mind. If they both say "yes," then I say go for it! I used to train my golden retriever at a "game farm" where we'd encounter more pheasant flushes in an afternoon than we'd see over an entire season in the wild. I never felt a whit of guilt. Apparently Jim Posewitz, author of Beyond Fair Chase, understands the dilemma this kind of hunt presents. He writes: "Shooting preserves where birds are put in the field present difficult ethical decisions. Ethical judgment has to be tempered by the realities of the people who use these places and the opportunities available to them. Shooting preserves protect isolated habitat that otherwise might be destroyed or developed; they provide habitat for other wildlife species; they provide opportunities for training dogs; novices can be introduced to bird shooting; and veteran hunters can maintain shooting skill." Confused? Log onto the new website, www.huntfairchase.com, orchestrated by the Boone and Crockett Club and backed by an impressive list of industry sponsors. Coincidentally, Boone and Crockett defines fair chase as "… the ethical, sportsmanlike, and lawful pursuit and taking of any free-ranging wild, native North American big game animal in a manner that does not give the hunter an improper advantage over such animals." Hunting preserves can meet all of the B & C's criteria, save free-ranging. Hence, no "high fence" harvested game animal can qualify for the Club's record books. Author Posewitz defines fair chase as "… a balance that allows hunters to occasionally succeed while animals generally avoid being taken." Expanding on Posewitz's position is Thomas Baumeister, Montana Fish, Wildlife and Parks Hunter Education Coordinator: "The kill is the exception and escape is the rule. Simply put, a chase is fair if the animal has a reasonable chance of escaping the pursuit unharmed. If the animal has little or no chance, the chase is not fair. Fair chase demands a balance of power between hunter and hunted. The hunter's ability to track, pursue, and acquire an animal must not be greater than the animal's abilities to elude capture or death." Another respected record-keeping organization, the Buckmasters Whitetail Trophy Records (B.T.R. ), does include a provision for whitetails harvested behind game-proof fences (but it is subject to strict guidelines governing fair chase and hunting ethics). Explains B.T.R. spokesman Russell Thornberry: "We acknowledge that, in specific circumstances, whitetails can be hunted ethically within game-proof fenced properties. We also believe that private lands, to a great degree, may hold the very future of trophy whitetails. I am sympathetic to those who high-fence their properties in an effort to allow their deer to mature and benefit from good management practices. Often this simply cannot be achieved [in open lands], especially where quality deer management is not generally embraced or valued." Adds Thornberry: "However, I am adamantly opposed to canned hunts. I have hunted on high-fenced properties that were as difficult as any unfenced places I've hunted. Perhaps the main difference was the potential for a real trophy buck. Conversely, I have seen some private and commercial hunting operations that were disgraceful and could in no honest terms be called 'fair chase.' My bottom line is that if the treasured sport of ethical hunting means less than the score of antlers, then we're in it for all the wrong reasons." These sources help test your ethics IQ, but you’ll still have to balance which fair chase principles apply to guns and which apply to bows. While some skilled bowhunters seem to make the sport look "easy," limiting one's range drastically changes the landscape of any hunt—fenced or wild. The game of bows 'n' arrows will always be a primitive sport that demands more skill and dedication than other hunting methods. Regardless of your viewpoint, every sportsman must cooperate with, and support, one another. Even if it means what "they" do isn't what "you" do in the woods. Bottom line: If this hunt wags your tail, bark as loud as you want; if it doesn't, keep it to yourself. Ted Nugent's favorite is Y.O. Ranch near Mountain Home, Texas (west of Kerrville). Whitetail deer are plentiful along with many exotics, such as Fallow, Sitka and Axis deer, Corsican rams, Aoudad sheep and Blackbuck antelope. Of special interest is Y.O. 's unique "Africa in Texas" tour for viewing 58 species of non-game exotic species on the Ranch. Legends Ranch near Grand Rapids, Michigan, offers a true once-in-a-lifetime experience for trophy-managed whitetails. It encompasses 5 square miles of classic Midwestern whitetail habitat, and it offers many pricing packages, including trophy, management (cull) and bonus bucks. Top Rail Ranch near Penrose, Colorado, is a unique elk preserve. Approximately 2,800 acres top out at 10,000 feet in elevation. Both trophy elk and cull bull hunts are available. The operators entertain only one hunting party at a time. Jack Martinsen's Twin Creek Hunting Preserve is located in northwestern Wisconsin, about three miles from the shores of Lake Superior. 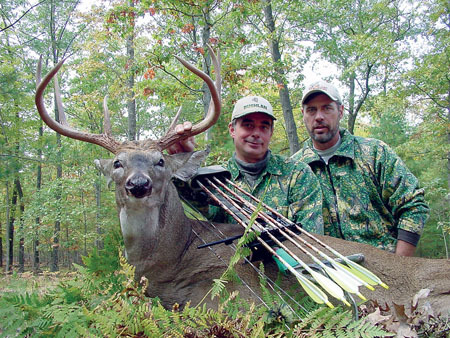 The 900-acre preserve provides a true North Woods setting for bowhunters targeting whitetail deer. A log cabin on the premises sleeps four; options include a flexible "beginner" rate ($1,000) that complements other packages reflecting the quality of the harvest; both food plot and deep woods hunting are available; also bonus trout fishing.